A QUARTER-finalist at Wimbledon last year where his victims included then-world No.1 Rafael Nadal, Aussie teenager Nick Kyrgios faces an uncertain future after his elbow problem flared again in the straight-sets loss to Andy Murray in the third round of the French Open. 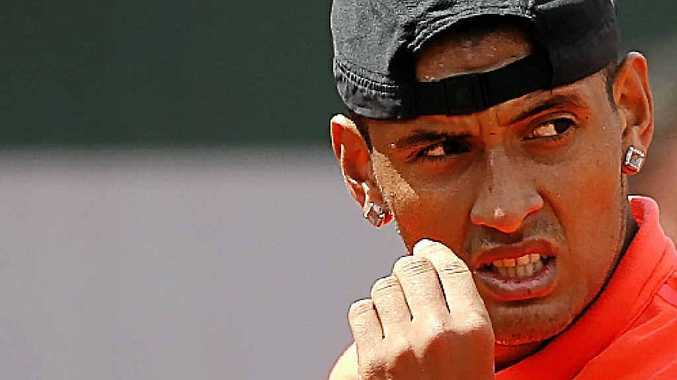 Clearly hampered by the injury, which saw him withdraw from the recent Nice Open, Kyrgios (pictured) dropped serve seven times and needed a medical time-out during the "heartbreaking" loss to Murray. "I have done so much and it's pretty heartbreaking going out there and something like that holding you back," Kyrgios said. "I don't know what I have to do at the moment, but I will do everything I can obviously to get ready for Wimbledon. That's the next big one. I think that's my best chance to win a grand slam." The 20-year-old was expected to play grasscourt tournaments in the Netherlands and at Queens in the lead-up to Wimbledon, but those plans are now in serious doubt. Kyrgios, whose path to the third round at Roland Garros was aided by a second-round walkover, had his arm heavily strapped during the time-out he took after losing the second set to the Scot. The world No.30 was still clearly agitated, at one stage telling the support group in his box: "I can't serve". "When the main part of your game - it's won me matches before, it's pretty much my main strength and it's not there - it's tough to play," he told reporters after the loss. Kyrgios is seen as a key member of Australia's Davis Cup squad for its crucial tie against Kazakhstan in Darwin next month, where the loser will drop out of the World Group next year. He missed the first-round tie against the Czech Republic in Ostrava in February due to a back problem. Meanwhile, fellow Aussie Thanasi Kokkinakis followed Kyrgios out of Paris, but not before serving notice of his considerable potential in the 6-4 6-4 6-4 loss to world No.1 Novak Djokovic. Playing on a wildcard, the 19-year-old, who came from two sets down to beat countryman Bernard Tomic in the second round, drew high praise from the Serb. "Tennis needs players like Thanasi, who is a teenager, but still able to come out on centre court and play with courage and play with power and belief," Djokovic said. The No.1 seed, chasing his first French Open title, will meet local hope Richard Gasquet in the fourth round. Victory in that encounter would put Djokovic on course for a quarter-final clash with nine-time champion Rafael Nadal. Hampered by injury since winning the event last year, the Spaniard showed he was close to his best by dismantling Russian Andrey Kuznetsov 6-1 6-3 6-2 to take his Roland Garros record to 69-1.